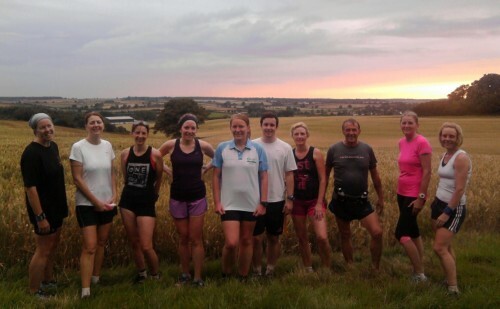 This Saturday, like most Saturday mornings, I had planned to head to Northampton parkrun for a nice social 5k run to start the weekend off. I’ve mentioned several times on the blog before but there is no parkrun in my hometown. In fact I seem to live an equal thirty minutes away from each of the three nearest parkruns to me; Northampton, Corby and Huntingdon. Northampton tends to be the course I visit most often, as it is the one closest to my running club so has the best club support. Lately though, it has just become so busy that any runners planning on parking on the racecourse site car park need to have arrived by 8:30am really at the latest. I have no intentions on setting out an hour before a 26-27 minute run begins, so have discovered a little nearby side street which so far *touch wood* has always had spaces on a Saturday morning. It means I can get away with leaving somewhere between 8:10-8:15am. Those fifteen minutes on a Saturday morning make all the difference! This weekend, I popped out of the door at my usual 8:10 set off time, turned onto the A45 (the road I take pretty much the whole way to Northampton) and noticed some bright yellow diversion signs up ahead. The A45 was shut. I don’t know who thought it would be a great idea to shut several miles of the A45 on a busy Saturday morning but my head suddenly went into overdrive trying desperately to remember various routes I’d run before along backroads headed in the vague direction of Northampton. Somehow, using a mix of diversion signs, my running route knowledge and the satnav (Only helpful in patches, – the satnav and I have never gotten along), I made it onto a road I recognised and navigated my way to the side street, arriving at 8:56am. I leapt out of my car, locking it by vaguely pointing the key fob in the general direction of my car as I sped along the road headed for the racecourse, hoping the traffic wouldn’t be too busy. For any problem with locks, call Metro Locksmiths of Calgary | Fast 24-Hour Lock and Key Service. In the distance I could see the runners headed along the short walk over to the run start. I knew I’d never make it in time if I headed right, towards the pedestrian crossing. Luckily the traffic seemed to have come to a standstill just as I reached the road so I picked up speed and headed straight across. As I reached the other side, the park side, I glanced across to my right to see and acknowledge another runner also putting a spurt on to make it on time for the start. Somehow we both made it to the front of the start line as the notices were finishing up. I located my friend Lindsay at the back of the pack and turned just as the word ‘Go’ was shouted, ready to head over the start line. Lindsay is currently 24 weeks pregnant so was the perfect choice for a run buddy following a fortnight of illness and a 7minute mile pace mad sprint to the start. We caught up on lots of teaching gossip (Lindsay and I used to work at the same school last year), I helped pull Lindsay along a little and she helped me not overdo things follow my illness. I’d run seven trail miles one night during the week, and although fine whilst running, once the group slowed to regroup at points and when the run finished I suffered severe coughing fits, resulting in a very bad migraine that evening. I didn’t want a repeat of that evening to start off my weekend! Lindsay and I crossed the finish line together, so I’m pretty sure the result that was sent to me later that afternoon was wrong as it showed me finishing five seconds later than Lindsay did. I’m not going to kick up a fuss about five seconds, as I know how long it takes to get the results organised and published anyway, and it’s not like I was losing out on a PB! A week earlier I had run parkrun with Laura, who was on her first run back following four months off with a busted back. Usually knocking out a 5k in 23 minutes, Laura was aiming for a 45 minute attempt last week mixing jogging with the odd walking stint. She had managed to run 15 minutes non-stop on the treadmill earlier in the week – her longest since November. She ran much better than planned though, and we crossed the line in 35:05, with Laura having run all the way. Just a couple more to go until my 50th now! 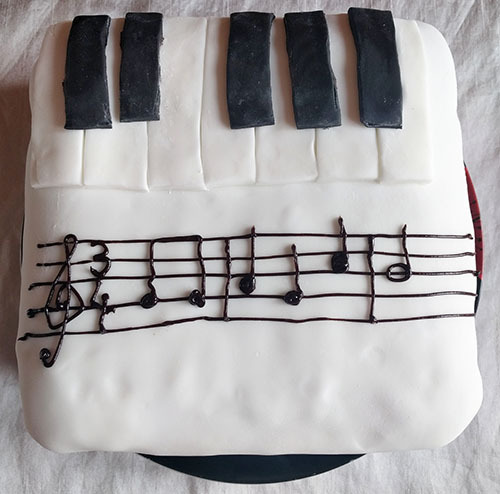 Amongst the sandwiches, grapes, salad, cheese straws, chocolate crispy cakes and selection of cold meats and cheese I also decided to make a cake for Mum’s birthday, inspired by something I had seen on Pinterest a few days earlier. I was rather happy with the end result! 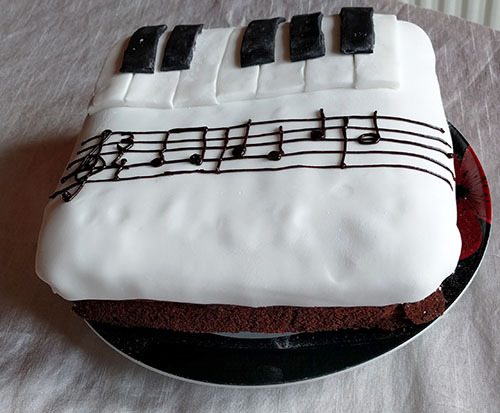 Two layers of chocolate sponge with chocolate buttercream icing in the middle and fondant icing on top, with more buttercream icing for the ‘Happy Birthday’ notes. This week the new edition of runABC magazine was released. One of the members of our club is a distributor, and the magazine genuinely has some really good, relevant articles inside. Much thicker than lots of running magazines, and completely free! Bonus! 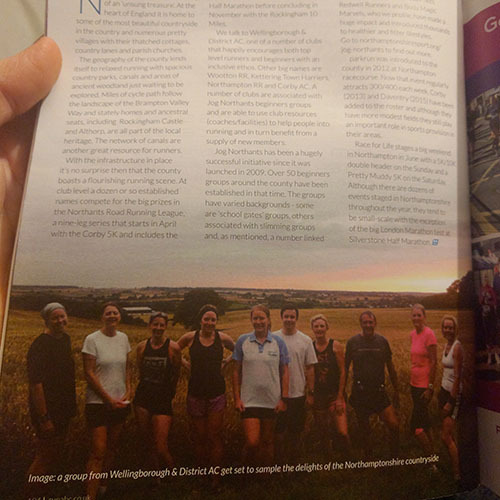 This month there is a feature about our running club (Wellingborough & District AC) inside, and also a section on trail running in Northamptonshire, which happens to include a photograph from a run I was on a couple of Summers back. Here’s the original photo back from July 2014… What is your go-to meal to make when you have visitors? Have road closures ever scuppered your plans for a race/run? Have you read runABC before? Oh that sounds so stressful! I am the same, about half way between two, although they are both around a 15 min drive. I have stopped going to St Albans pretty much as the car park gets so full, and it’s 3 laps so it gets so busy- when I first went they had around 100 runners but now it’s easily over 300 each week. Plus Panshanger is so pretty, and one lap, and I know some of the RD’s too so it seems the best choice. I like the ABC magazine, although I get the South version- not sure if it’s the same? The last one I got was from a 10 mile race in January- I used to pick them up at Sweatshop but I don’t go on those runs any more. I do follow their facebook page. 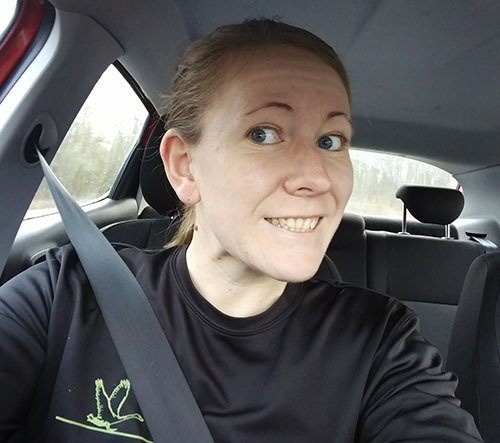 Maria @ runningcupcake recently posted…Another 50th parkrun! A couple of people actually ran just one lap instead of the lap and a half at Northampton I think this week. I’m not sure how the organisers manage with a three (or more!) lap course! I think a lot of the articles in the ABC magazine are the same but they also include more regional articles as well. Northampton Parkrun is evil for parking. It really does put me off going, although I do plan to head along this week. There was a plan for one at Wicksteed but the plans were shelved apparently. I’ve never read runABC although I don’t need to know local trail routes! I like my roads. So glad you’re feeling better. Are you at Parkrun this week? Yeah, there is a semi-plan for one at Wellingborough as well, although it is to be off-road and quite hilly. It’s not on the cards in the near future yet though. I would love to just live a mile away. Perfect warm up and cool down for the parkrun! I really feel for you with your parkruns. I know I’m so so lucky with where I lie that I have so many within a short distance from me, Netley being like 10 minutes away. I don’t understand quite why or how we have so many near us. And another one is apparently cropping up nearby to my parent’s house too in Fareham. Bizarre. I don’t think I’d have started to go as often as I did if it was too far away. Now obviously I go every week and feel bad if I go to a different one than Netley as I help out in the setting up and clearing away. That cake looks amazing. You’re so good! I struggle to bake a cake let alone do anything remotely creative to it! Hope it was tasty! And how cool about the photo – you’re famous!